"It must be remembered that when George Szell came to prominence in the United States in the mid 1940s (and his mid-forties) he was a highly respected conductor and musician in Europe. He had a very solid grip on his repertoire which soon expanded to new works which he was debuting and championing. However, all that most music lovers around the world today know about Szell’s artistry they have divined from the recordings made by Columbia in Cleveland from the late 1940s on. In an interview with Szell as an intermission feature in one of the weekly broadcast concerts he stated that Columbia allowed him to record items that he requested only if they were not in conflict with Ormandy or Bernstein. Those he did make revealed meticulously prepared performances which could be misinterpreted as being somewhat objective. The lean balances of those LPs and then CDs only reinforced that impression. Happily, two new four discs (priced as three) sets of live Szell performances from Cleveland and New York tell another story. It is very clear throughout that Szell was not a conductor working on his interpretations. He knew exactly what he wanted and he got it. These sets, published by West Hill Radio Archives of Don Mills are derived from immaculate sources and contain many revelations. 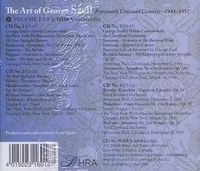 The Art of George Szell Volume One (WHRA-6018) opens with Szell’s début concert with the New York Philharmonic Symphony Orchestra from Carnegie Hall on July 4, 1943. WW2 was still raging and as was the custom in all countries, the concert opened with orchestra and audience joining in the national anthem. I must say that most national anthems really touch me and this one is no exception. Fine performances of the Beethoven Seventh, The Moldau, and the Tannhäuser Overture follow and the concert ends with The Stars and Stripes Forever. A concert from the following week on the second disc includes the Mendelssohn Fourth, Don Juan, and Rhapsody in Blue with Eugene List in an ‘uptown’ symphonic performance with lots of energy and bravura... a far cry from Paul Whiteman. From Szell’s début concert with the Cleveland Orchestra on November 2, 1944 we are treated to The Overture to The Bartered Bride, Szell’s orchestration of Smetana’s Quartet in E minor, and Till Eulenspiegel. Szell worked closely with Strauss and we know that at least one, if not more, of the recordings ‘conducted’ by Strauss were actually from the baton of young George. Other highlights of the set include Capriccio Espagnol and the Prokofiev First Violin concerto with Szigeti and the Philharmonic from 1945. The Art of George Szell Volume Two (WHRA-6019) contains exceptional performances of Lalo’s Symphonie Espagnole (four movements) with Alfredo Campoli, and Brahms’ second piano concerto with Clifford Curzon both from 1953 with the Philharmonic. Concerts in Cleveland during 1957 included the Euryanthe Overture, The Prelude and Good Friday Music from Parsifal, the Beethoven Sixth, Haydn 97th and the Schubert 9th. Finally, from 1953 we hear the Franck Symphony in d minor and one of Szell’s specialities, the Sibelius Second Symphony. I was taken aback by the high quality of the sound throughout these discs, which is clear and dynamic, giving very few clues to the vintage. Only the Prokofiev shows its age." “Part of the wave of great Hungarian conductors who took over American musical life just before and after World War II - the others included Fritz Reiner, Antal Doráti, and Eugene Ormandy - George Szell quickly transformed a middling Midwestern orchestra into one of the nation's ‘Big Five’. His cultivation of the Cleveland Orchestra set an example of discipline and hard work that gradually helped raise the standards of orchestras across America. Szell was a wunderkind, playing a Mozart piano concerto with the Vienna Symphony Orchestra when he was ten, and composing a number of solid chamber and orchestral works in a lush, late Romantic style as a child and teenager. He was 17 when he conducted the Berlin Philharmonic in a program that included one of his own compositions. Despite these early successes, Szell rose through the conducting ranks in the traditional way of the period, with a series of opera positions: Royal Opera of Berlin (1915-1917), Strasbourg (1917-1918), Prague (1919-1921), Darmstadt (1921-1922), and Düsseldorf (1922-1924). Szell's first prestigious post came to him in 1924, when he was named first conductor of the Berlin State Opera; he simultaneously served as a professor at Berlin's Hochschule für Musik. In 1929, he moved on to become general music director of the German Opera and Philharmonic in Prague, where he remained until 1937. Szell began focusing more on orchestral repertory in the 1930s; he made his U.S. début as guest conductor of the St. Louis Symphony in 1930, and in 1937 he was appointed conductor of the Scottish Orchestra in Glasgow, while maintaining a steady relationship with the Residentie Orkest in The Hague. Szell was in America in 1939 when war broke out in Europe; he remained in the U.S. through the war, first depending on guest engagements and then, in 1942, becoming a regular conductor at the Metropolitan Opera, where he was especially praised for his Wagner performances. In 1946 Szell took American citizenship and became music director of the Cleveland Orchestra, a post he held for 24 years. He was also the New York Philharmonic's music advisor and senior guest conductor during the last two years of his life. Although Szell made recordings in Europe in the 1950s and 1960s for Decca, and in Cleveland at the end of his life for EMI, the bulk of his substantial discography was the result of his long collaboration with Columbia Records in Cleveland. There, Szell had inherited an able but ordinary orchestra and, through sheer determination, molded it into one of America's finest. A Szell performance was remarkable for its textural clarity, chamber-like balances, and precision of attack and release. He drilled his orchestra mercilessly, even in works it had performed with him not long before. Szell was particularly admired for his performances of Austro-Germanic classics from Haydn to Richard Strauss, his sharp renderings of works by a select group of twentieth century composers including Bartók, Prokofiev, Janácek, and Walton, and his idiomatic way with Dvorák. Indeed, some collectors maintain that Szell's monaural, early 1950s recording of Dvorák's Eighth Symphony with the Concertgebouw Orchestra has never been equaled. His treatment of French composers, on the other hand, was criticized for its lack of atmosphere, and detractors maintained that he achieved precision at the expense of emotional expression. To those who demanded a warmer approach to his beloved Mozart, however, Szell is said to have retorted: ‘One does not pour chocolate sauce over asparagus’."